You are the core of our user base. You keep the system running - maintaining patient data, confirming their eligibility, booking new rides and managing existing ones. Maybe the job of booking transportation for patients fell to you because you are among the more computer savvy in the office. Or it’s just part of your job description. Regardless, your focus lies at the very foundation of the Circulation platform. As the primary users, you are also our most prolific source of product feedback. Whenever you call our support line with a product question, or use the ‘Report An Issue” link within a Trip Summary, it is logged by the Client Services team. Any time you use the “Contact Us” link to submit a feature request (shown below), it is automatically added to our feedback repository. Every month when your Client Services Manager checks in with your team, they are listening for what you can tell us about how the platform is working for you. Altogether, this information feeds into our understanding of how clients use the system, what works, and what needs improvement. Without even realizing it, you are helping to shape our product and “vote” on features. Many system improvements have come from this feedback. Take, for example, our latest release in which we restructured the Rider Profile to make key rider information more easily accessible. This came about as a direct result of learning about the limitations you felt in managing your riders outside of booking their rides. Our customer check-ins have brought to attention ways in which your processes for maintaining patient data weren’t fully supported by the platform. As a result we have improved the automated upkeep of rider eligibility, such as by introducing additional contact details to capture key information and locking other details to ensure data integrity is maintained. Your questions and comments surrounding the Book a Trip process have also lead to clearer field labelling and reordered entry fields to improve speed and overall performance (as we demonstrated last month). 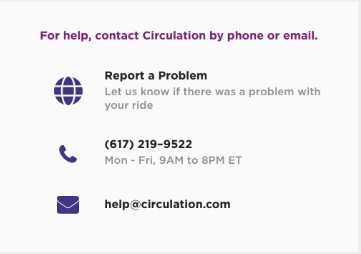 Lastly, in response to repeated requests for assistance, we’ve made it easier for end users to adjust billing details related to a ride after its completion. However complex benefit reimbursement may be, you can expect less headaches reconciling costs within our system! Without question, some of the best ideas for iterative improvements to our platform have come from all of you, our end-users. That’s why we encourage you to reach out to us with ideas, questions and/or feedback. If something is proving more of a hindrance than a help, or if you have a feature idea that would improve your workflow and make you more efficient, those are perfect topics to bring up to your Client Services Manager! In the meantime, we will be reaching out to our end users to solicit even more direct feedback. Stay tuned for ways to become a part of this process.